There is an allegation about the NKT that comes up from time to time, which is that NKT practitioners are not real Gelugpas. Hopefully the following answer to this will help. If you have any questions, please ask in the comments section. The truth is that NKT practitioners are actual Gelugpas. Those who exclusively follow Je Tsongkhapa’s teachings are called ‘Gelugpas’. The NKT is a pure Gelugpa tradition because (1) it exclusively teaches Je Tsongkhapa’s doctrine, (2) its lineage Gurus from Je Tsongkhapa onwards are exclusively Gelugpas, and (3) Geshe Kelsang’s spiritual education and root Guru (Trijang Rinpoche) are within the Gelugpa tradition. The Gelug or ‘Virtuous Tradition’ (also known as ‘Ganden’ tradition) was founded by Je Tsongkhapa (1357-1419AD), an emanation of Wisdom Buddha Manjushri. As predicted by Buddha Shakyamuni himself in Root Tantra of Manjushri, Je Tsongkhapa appeared in Tibet, the ‘Land of the Snows’, to re-establish the purity of Buddha Shakyamuni’s doctrine by establishing the ‘Ganden’ (‘Joyful Land’) tradition. Geshe Kelsang first introduced the title ‘New Kadampa Tradition’ to give the Centers under his spiritual direction a distinct identity within the wider Buddhist world. Although the Gelugpas were sometimes referred to as ‘new Kadampas’, the name ‘New Kadampa Tradition’ had never been used previously in a formal sense. Nevertheless, by using this title, Geshe Kelsang is making it clear that practitioners of this tradition are principally following the teachings and example of Je Tsongkhapa. The word ‘New’ is used not to imply that it is newly created, but that it is a fresh presentation of Buddhadharma in a form and manner that is appropriate to the needs and conditions of the modern world. Furthermore, by using the title ‘Kadampa’, Geshe Kelsang encourages his disciples to follow the perfect example of simplicity and purity of practice shown by Atisha and the Kadampa Geshes. Geshe Kelsang’s remaining books come from Je Tsongkhapa’s Lamrim (stages of the path) and Lojong (training the mind) teachings, from the Ganden oral lineage instructions passed on to him by his root Guru, from the Kadam Emanation Scripture, and from Shantideva’s Guide to the Bodhisattva’s Way of Life. While the presentation of the teachings is especially suited to people in this modern world, the meaning of the teachings has not been compromised: the teachings are the same as those given by Je Tsongkhapa himself. 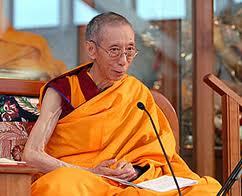 The NKT has an unbroken lineage of spiritual teachers from Buddha Shakyamuni to the present day. There is a pure lineage from Buddha to Je Tsongkhapa, and a pure Gelugpa lineage from Je Tsongkhapa to Geshe Kelsang Gyatso (see Great Treasury of Merit p. 99-100 [Tharpa Publications]). The lineage shows that the Buddhadharma practised in the NKT is, firstly, pure Buddhism in that it is the teachings of Buddha Shakyamuni; and, secondly, pure Gelugpa in that it is the teachings of Je Tsongkhapa. Geshe Kelsang received his spiritual education in the Gelugpa tradition, at Jampa Ling and Sera Je Monasteries, and principally from his root Guru, the great Gelugpa Master Kyabje Trijang Dorjechang, who was at one time the Throne Holder (‘Ganden Tripa’) of Je Tsongkhapa’s tradition. In addition to having been trained in the Gelugpa tradition, Geshe Kelsang has continued to follow the guidance and example of Trijang Rinpoche by devoting his whole life to promoting Je Tsongkhapa’s pure tradition, carefully basing every one of his writings and teachings on Je Tsongkhapa’s teachings, and especially by remaining uninfluenced by worldly concerns, thereby acting in accordance with the meaning of Buddha’s teachings.